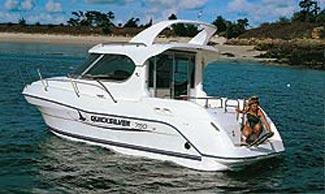 Boat Description This is an exciting cruising boat concept from Quicksilver. The 750 Weekend has two separate double berths plus a dinette which converts. It also has an enclosed head. This boat is fully equipped to enable you and your family to make the most of your leisure time on the water. It will carry up to seven people.Power is from a Mercury MerCruiser inboard diesel, durable, reliable and so economical. Just a few of the extras as standard: fitted galley, swim ladder, anchor locker, additional storage, opening deck hatch, bonded windshield and hydraulic steering. A splendid model with the good looks to match.